Description: This new and modern villa is in the popular area of El Alamillo, just a short walk from the beach. With a private pool, terraces with sea views and a high standard of accommodation, it provides the perfect setting for a family holiday close to the town of Puerto de Mazarron. The property has a secure lockable entrance gate and front garden with private plunge pool. This is paved and has space for sunbeds to lounge in the sun by the side of your pool. Entrance to the villa by the rear door into the modern and fully equipped kitchen with breakfast bar and stools, featuring dishwasher, oven and hob, fridge freezer. The washing machine is outside the villa. From the kitchen, enter into the main living area, which is spacious and has patio doors opening out onto the pool. With aircon run by a card meter system ( guests can buy cards on arrival from the local Representatives and 10 euros credit is included to start you off) plus ceiling fans, the house is ideal for all year round holidays. There is a large comfortable chaise style sofa, modern dining table with 6 chairs and a downstairs shower room. The flat screen TV has channels in both English and Spanish, and there is also a Playstation and selection of games for the younger members of the party to amuse themselves. If you prefer to relax to a little light music, there is a BOSE sound dock. There are fly screens throughout the villa, meaning windows can be left open at night if required. The smaller twin bedroom is also on this floor. Heading upstairs there is a larger twin room, bathroom with large shower cubicle and the larger master bedroom. The master bedroom has a king size bed and it´s own en-suite bathroom, and also has a lovely small terrace off the side with patio set and 2 chairs, ideal for enjoying your tostada and tomatoes in the fresh air. If you carry on up the staircase, you will arrive on the upper solarium, where there is a large patio set including table and lounge furniture for enjoying meals, drinks and cocktails, which can be sipped whilst watching the sun set across the bay. 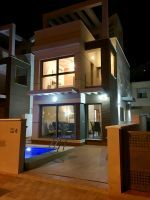 The villa is on a new urbanisation, just a few minutes walk from the nearest beach and with plenty of parking in the street outside. (Please do not park on the tiled patio as it is not strong enough for the weight of a car) There are bars and restaurants within 10 to 15 minutes walk, and a supermarket in high season. The villa is only 5 minutes drive from the beautiful yatching marina at Puerto de Mazarron, which is a market town by the sea. Here you will find a huge variety of bars and restaurants to sample local produce. Plus yet more Blue Flag beaches for the smaller members of the family. Further afield, the cities of Cartagena and Murcia are bustling, and have various sites of historical and cultural interest such as the castles, cathedral and pedestrianised paved shopping area. The Costa Calida with over 300 days of sunshine a year is ideal for holidays and longer Winter stays. All our holidays include the Meet and Greet Service and the services of a local Resort Rep to help with any issues during your stay.